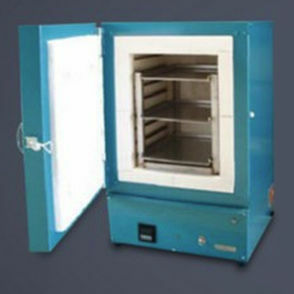 Our Ashing, Calcining and Roasting furnace range is available in a range of sizes. Our engineers work closely with our customers to select the right furnace for their needs. Cabinet is 1.2mm zinc anneal sheet metal, lined with insulating fire bricks, backed with Superwool insulation board. The furnace is finished in Hammerfin blue enamel. Insulating fire-brick backed with HT Board. A rack fabricated from 25 x 25 x 5mm 304 stainless steel angle to accommodate 3 trays at 125mm centres. Trays fabricated from 2mm 304 stainless steel sheet 270 x 370 x 15mm deep. 450 mm high x 350 mm wide x 400 mm deep. Spiral elements of Kanthal “A1” wire carried in grooves machined into the walls of the furnace. Element rating 3.5 Kw single phase. Electronic, Automatic control 800°C, type “K” Thermocouple. Switching Solid State Relays on PID control.